Chance became a member of the H.O.P.E. Acres family a few years ago and was adopted into a loving home in 2016. Unfortunately, he developed a medical condition requiring surgery that was beyond his new family's financial ability. In January, he underwent surgery to remove two abscessed teeth that were causing him a lot of pain, and had his sinuses irrigated. Thank you to everyone for supporting Chance during his recovery. A sweet, friendly gentleman, we hope that Chance will soon be feeling like his old self again. Interested in adoption? Visit our adoption page for more information or contact our adoption coordinator by clicking the email link below. Interested in sponsorship? You can visit our sponsorship page for more details, or click one of the buttons below to make a donation. Select any amount, either a one-time gift or a recurring contribution. 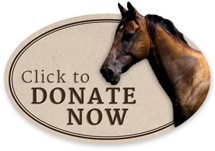 Please remember to specify the name of the horse you've chosen to sponsor in the comments section. Thank you!